Does PubNub provide WebRTC and video chat? What sort of services does PubNub provide with respect to WebRTC and video chat? Before we get started here please review 3 Things WebRTC Can Not Do. We get this question quite frequently because many struggle to understand the role that PubNub plays in WebRTC and video chat applications. So we will provide you with some details that should leave you with a full understanding of all the moving parts and the role those parts play. Wikipedia says that WebRTC (Web Real-Time Communication) is an API definition drafted by the World Wide Web Consortium (W3C) that supports browser-to-browser applications for voice calling, video chat, and P2P file sharing without the need of either internal or external plugins. What does PubNub bring to the table? You are going to need a signal protocol service. In other words, a rock solid reliable, low latency messaging service (that would be PubNub) and a hosted WebRTC solution for the audio/video streaming (PubNub does not handle this sort of media). Once signaling has taken place, video/audio/data is streamed directly between clients, using WebRTC’s PeerConnection API. This peer-to-peer direct connection allows you to stream high-bandwidth robust data, such as video. PubNub makes the signaling incredibly simple, and in addition, gives you the power to do so much more with your WebRTC applications. PubNub is not a server for WebRTC. In other words, video and audio data is not streamed over the PubNub network. A signaling service specifies ICE servers that the video chat can stream over. Public STUN servers provided by google can be used, but they are not very reliable. 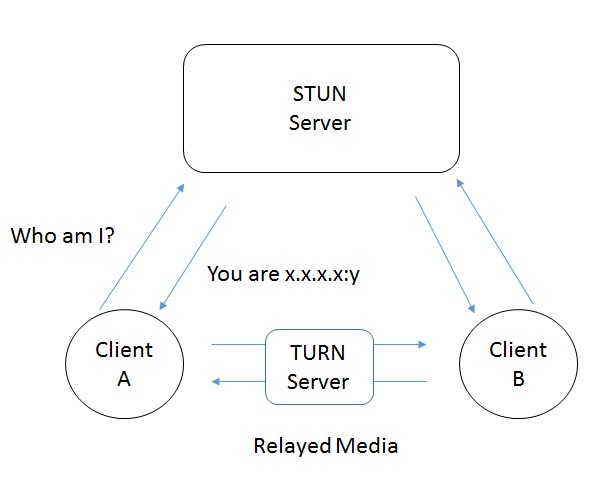 STUN or TURN servers are required to circumnavigate a firewall, else it will fail. Many services provide the total package of signaling and server in one, that is not PubNub. Our audience are the people who want to build their own, more custom service. What is purpose STUN & TURN? TURN will stream the binary media (audi/video) which does not flow through PubNub's network. So STUN provides the IP but there is nothing in WebRTC to provide a means to exchange IPs between clients and that is where PubNub comes in to server the role of the signal protocol. If you are ready to build it all using just WebRTC, a streaming service and PubNub for your signaling, then you are ready to rock with the above details. But if you want to have much of this abstracted away then keep on reading below to find out about some offerings that will get you to your end goal faster and with less effort. Sinch is a cloud-hosted, mobile communications platform that makes adding calling, verification, video, SMS, and IM into apps easier than ever. They have an SDK that is powered by PubNub and many PubNub customers use Sinch in their applications. WebRTC is just one of the many features they offer - POWERING COMMUNICATIONS FOR MOBILE APPS: use the Sinch APIs to enhance your app with Voice, SMS, Verification, Video, and Instant Messaging. XirSys hosts STUN and TURN servers catering to the needs of WebRTC applications. What are STUN and TURN server for? When you deploy your WebRTC application, you may need STUN and/or TURN servers (not a PubNub service) to make it all work. See this Stack Overflow thread to get a better understand of this. One-to-many: Instructions on MCU for 1-to-many media servers. Necessary for large group chats and streams with hundreds+ users. So as you can see, we do not provide audio/video streaming services but if you are building this solution, PubNub is a necessary piece to tie it all together with the signal protocol. PubNub AndroidRTC example by our interns. Can users receive messages on all pages of my site? Can I subscribe to messages while the page is still loading? How do I use HTML5 with PubNub? How do I detect local connection state?